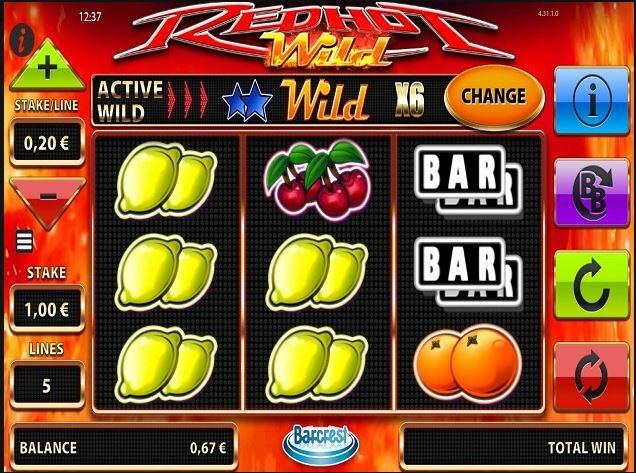 Red Hot Wild is a classic styled slot powered by Barcrest and it has 5 paylines, on 3 reels on 2 rows. You will come across symbols such as cherries, lemons, oranges, pears, plums, melons, bells, bars, stars, and the Lucky 7´s. This game offers a very unique Wild feature, in which you get to choose your own Wild symbol, and each of them will come with an eventual multiplier and risks. The cherries, lemons, and oranges are for examples Wild that gives you 1x multipliers. The pear and plum will double your win, and the melon will triple it. As you receive a bell or the star, you will receive a multiplier of 6x your bet. But, best of all symbols is the Lucky 7, of course. It offers the highest reward as it grants you with a 10x multiplier. You are able to change your Wild anytime you wish.